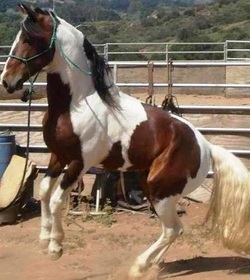 Although Toby is no longer with us, he was the most beautiful, talented, and beloved tobiano Tennessee Walker. Toby was originally rescued by Falcon Ridge and then adopted by the Bone family: husband Aaron, wife Lisa and son Slater. Toby was Slater's constant companion and friend, and Lisa's soulmate. Toby remains the inspiration and guardian of this rescue. Founded March 2012 in Toby's memory, Toby's Legacy Equine Rescue was established to provide temporary and permanent physical, emotional and mental rehabilitation for distressed and at risk equines. We work with our local Animal Control agency, the community, and attend auctions to rescue the abandoned, the most neglected, the unwanted, and abused. Our rescue efforts have expanded to include donkeys, bovines, pigs, goats, mules, and even a beefalo named Buffy. All our residents have been let down in one way or another, and carry the heavy burden of distrust, fear, anger, and/or resentment. They carry the scars, both physically, and emotionally. It has been our mission, our passion, along with our volunteers to provide every animal in our care, an environment where they can begin to lower their protective walls and heal. At Toby’s Legacy, our residents are housed in large paddocks or pastures. They live in herds and have access to graze 24/7. We envisioned a place as close to nature as possible and strive to recreate that. What we have discovered is a virtual reset button in rehabilitation. Our horses learn to be horses again with no expectations, agenda, or timeline. Toby's Legacy is a volunteer-run 501(c)3 nonprofit organization and 100% of all donations go directly to meet the immediate needs of the horses. Help us continue our mission, and most important work, and Donate today! Thank you! Don't miss out again! Stay up to date with all of Toby's Legacy's News!